Anyone who has tried making a word clock from our previous designs is likely to be as disappointed as we were – they still don’t work! 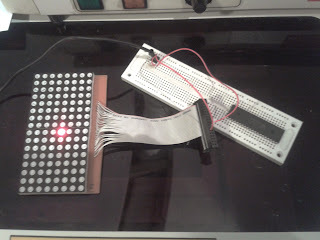 This despite us actually reading the datasheet and laying out the pcb accordingly. The problem this time wasn’t that we’d connected the wrong pins (earlier assuming that all the “row” pins were on the top and all the “column” pins were on the bottom) but more that we hadn’t identified which pins were which! 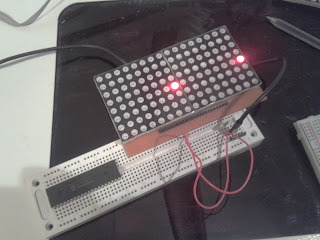 Now at no point should putting a single power source onto a single pin cause more than one LED at a time to light up. Something was obviously very wrong! 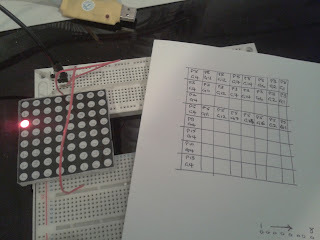 And so began the painful, laborious task of applying 5v power to one pin (through a 220ohm resistor of course) and ground to another, and charting which combinations caused which LEDs to light up. Our final chart didn’t resemble the datasheet in any way – we were grounding pins which the datasheet said were LED anodes, and putting power onto pins that the datasheet said should be pulled to ground. 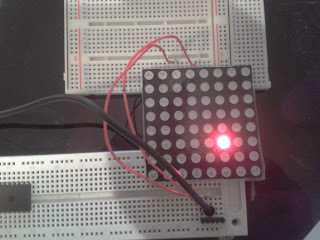 Once we’d identified which pin caused which “row” to light up, and done the same to find which pin to ground caused the LEDs in a specific column to light, we stopped filling in the grid and just did some random sample testing to prove our theory. Each test worked fine, so we were confident that we’d correctly identified the row and column pins. 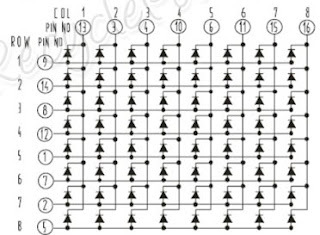 There was no denying the hand-written grids – they were what we’d actually witnessed, datasheet or not. 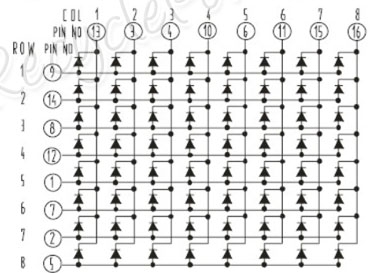 But they just didn’t match with the datasheet at all. Just before we binned the datasheet and presumed it belonged to another module, we tried changing the presumed layout of the pins on the board. Following this layout, suddenly the datasheet made sense! 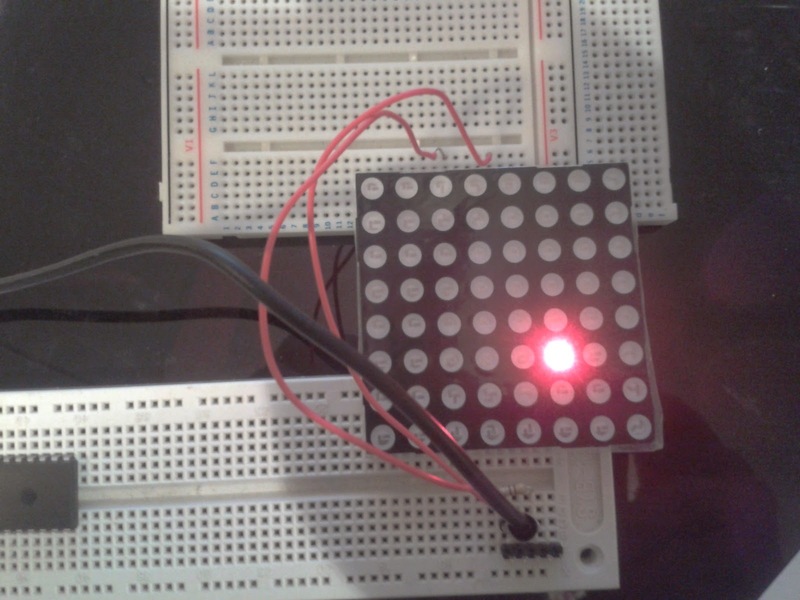 We could read the pins on the datasheet, work out which LED should light by putting power and ground onto the appropriate pins and then proving this to be correct. This time, everything matched up. We’d finally worked out how to make the LEDs light up in the correct way. But one thing remained – the pcb was, once again, wrong!